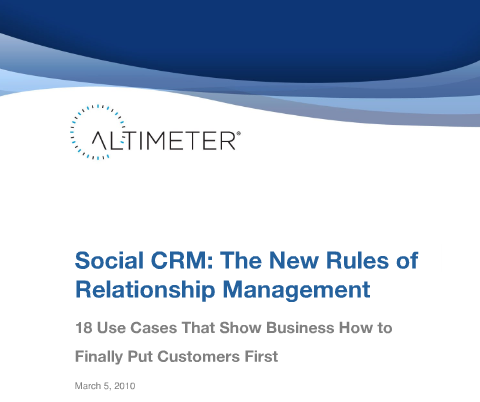 Since joining Altimeter Group, I’ve had the pleasure of collaborating with my colleague Jeremiah Owyang on Social CRM. On a daily basis, the requests for Social CRM strategies escalated from all parts of the organization. In fact, requests reflected all facets of CRM including the usual sales, marketing, service and support to advanced areas such as innovation, collaboration, and customer experience. Who’s been asking? Well it’s our clients, blog readers, and prospects. They represent the line of business guys, the IT teams, the marketing gurus, and the board members who have told their executives that they need to do something social. Discover where the conversations are happening in this new social world. Identify who’s influential and if they are customers or not. Determine a tiered approach to engagement or re-engagement. Bring the social channel back to existing CRM systems. This is the basis for the groundswell in Social CRM. But keep in mind, Social CRM does not replace existing CRM efforts – instead it brings more value to existing efforts and should complement the uber CRM strategy. Social CRM reflects the new world of disruptive technologies and the related business models, processes, and organizational requirements we live in. Hence the multi-disciplinary approach to this research. We’ve paired Jeremiah’s expertise in social technologies and customer strategies with my background in CRM, enterprise applications, master data management, and order management. Our goal – take a holistic approach across multiple business departments, roles, and processes. Given the newness of this topic, we also went out to the community to collaborate and define the use case framework. We started with the “godfather of CRM” – Paul Greenberg and worked with 11 other gurus in a concerted fashion and with some level of serendipity. Thanks go out to the individuals below and the for putting up with endless revisions, late night skype chats, and debates about client demand and technology maturity (see Figure 1). 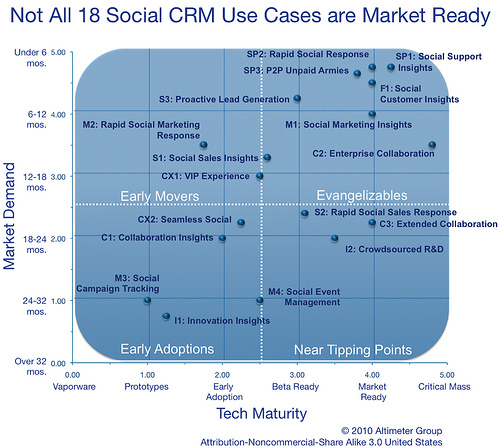 From there, we validated the framework with over a 100 Social CRM pioneers. As a final process, we then tested out the framework with 30 vendors in the space for a sanity check (see Figure 2). 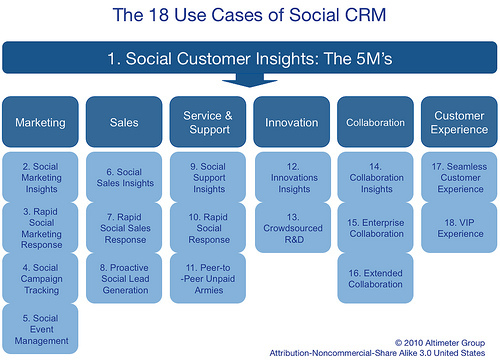 The result – 18 Use Cases of Social CRM with input from 100 pioneers and 42 influencers in the market. With all this in place, additional thanks go out to Christine Tran our researcher who helped us tremendously on the production of this report and Charlene Li for her edits! At a high level, we’ve prioritized the use cases into 4 categories by market demand and technology maturity (see Figure 4). Evangelizables. This category represents market demand that is less than 16 months and technology maturity between beta ready technologies and those with critical mass. Near Tipping Points. This category represents market demand that is more than 16 months and technology maturity between beta ready technologies and those with critical mass. Early Movers. This category represents market demand that is less than 16 months and technology maturity between vaporware and beta ready technologies. Early Adoptions. This category represents market demand that is more than 16 months and technology maturity between vaporware and beta ready technologies. The Bottom Line – Take Action Today! Sign up for the webinar series. This is a deep topic, and the report is only the tip of the iceberg. As with other disruptive topics, we’re going to offer a series of free webinars to explore each of the use cases in detail. Sign up for the webinar now, as we can only have 1000 attendees per webinar, as our last webinar had over 1100 registrants. Read, then spread this report. As with open source, the Altimeter Group believes in open research. We want our ideas to grow, and others to take advantage of it. So if you found the report helpful, please forward the report to internal constituents, partners, vendors, clients, and blog it. Use it in your presentations, business plans, and road maps. The final report is embedded below, and there are download features for your own use. Have an internal discussion. Evaluate your current situation at your company, then draw up which business needs need to be tackled first, use the use cases as a roadmap by mapping out which phase comes first, and which phase comes second. Keep business value in mind at all times! Learn more and join the community of pioneers. This is new territory, we don’t have all the answers, so we’ve created at group in which pioneers can learn from each other. It’s free, and the conversation has started already, jump into the group, and learn together. You can read Jeremiah’s POV. So ready to put the framework to use? Any use cases we should add in the future? We encourage you to let us know what else you see out there. We know there’s more than 18 out there and we’re already revising this report to include new use cases! You can post or send on to rwang0 at gmail dot com or r at softwaresinsider dot org and we’ll keep your anonymity or better yet, join the community! This report was entirely funded by the Altimeter Group. Client list disclosures are available on the Altimeter Group Website, providing clients give us permission approve.